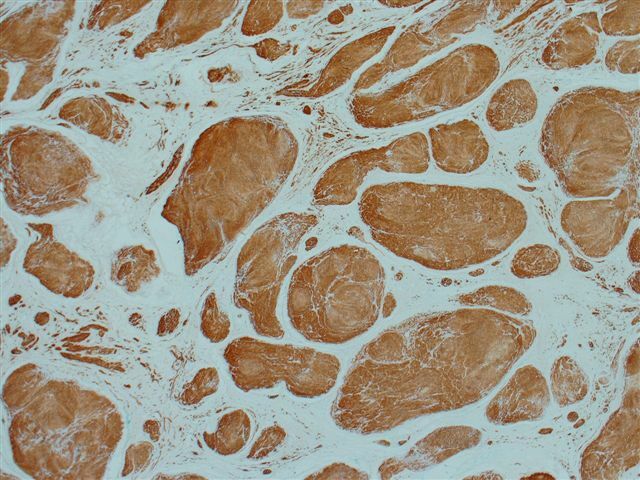 A 12 year old girl had a solitary superficial tumor of the back.� She had no significant medical history. 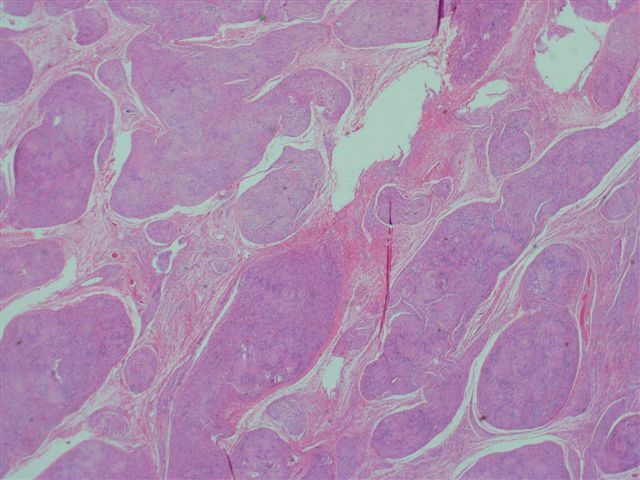 The microscopic images show a plexiform architecture (image1), with nuclear palisading identifiable at medium power (image2).� Although schwannomas usually have a biphasic pattern of Antoni A (short fascicles of spindle cells with nuclear palisading and Verocay bodies) and Antoni B areas (less cellular areas with irregularly spaced vessels), it is not prominent in these images.� There are also more cellular areas (image3), and strong S100 immunoreactivity. 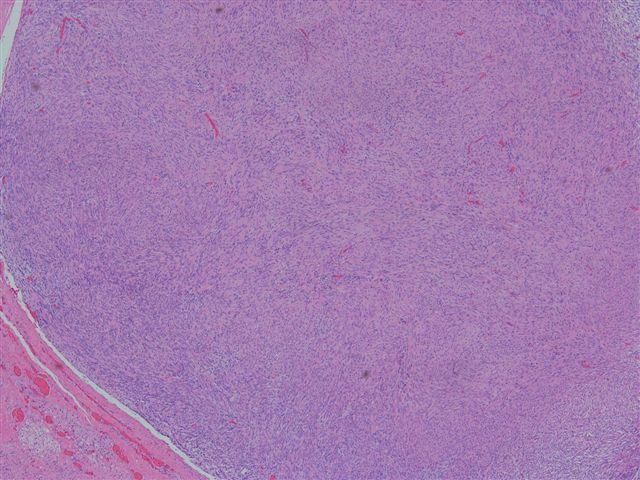 Only 5% of schwannomas have a plexiform or multinodular growth pattern.� Unlike neurofibromas, this pattern is not strongly associated with neurofibromatosis 1 or 2.� These tumors usually are superficial, and located in the dermis or subcutaneous tissue.� They are frequently cellular with hyperchromatic nuclei and increased mitotic figures.� There is usually no/minimal necrosis or myxoid change.� All tumors show strong and diffuse S100 immunoreactivity of the nodules, with no staining of the intervening stroma. The differential diagnosis includes plexiform neurofibroma and malignant peripheral nerve sheath tumor (MPNST).� Plexiform neurofibromas almost always develop during early childhood and are considered pathognomonic for neurofibromatosis type 1.� They are associated with grossly enlarged and tortuous nerves.� Microscopically, they are hypocellular with a myxoid background and lack the biphasic pattern seen in schwannomas.� However, they occasionally show nuclear palisading.� Although neurofibromas are S100 immunoreactive, there is only staining of scattered cells that are diffusely throughout the lesion.� In contrast, schwannomas show strong staining of the tumor nodules and no staining of the intervening stroma.